This will be a short post, but I’m a woman of my word! 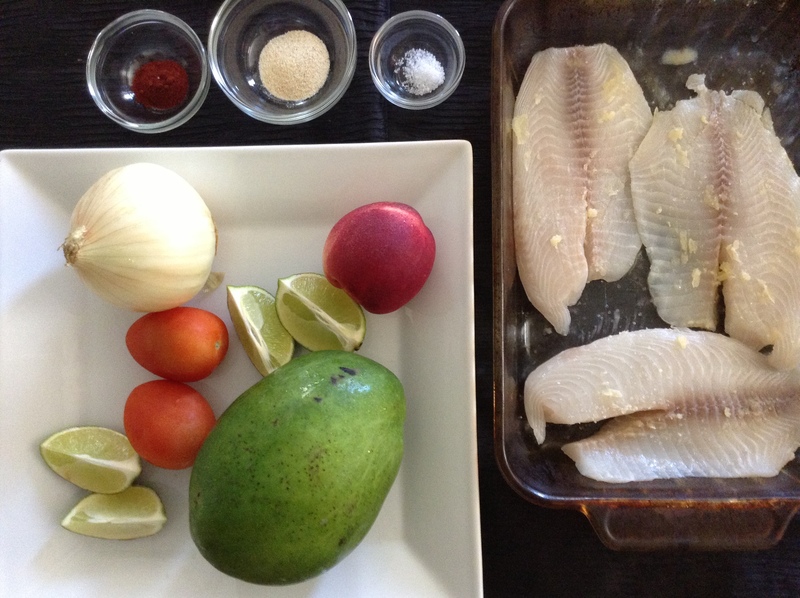 As promised, here is the recipe for the fun and fruity fish dish (say that 5 times fast) posted on my Instagram a week or so back. This was made originally as a primal dish, as it includes ghee (dairy), but is just as wonderful if olive oil is used in place of the ghee. Paleo or Primal, I really hope you enjoy this as much as I did! Preheat your oven to 375° (F) or 190° (C). Place half the ghee or oil in the dish and put the fish on top. Season the fish on both sides and add the remaining ghee/oil on top of the fish. Bake for approximately 20 minutes. 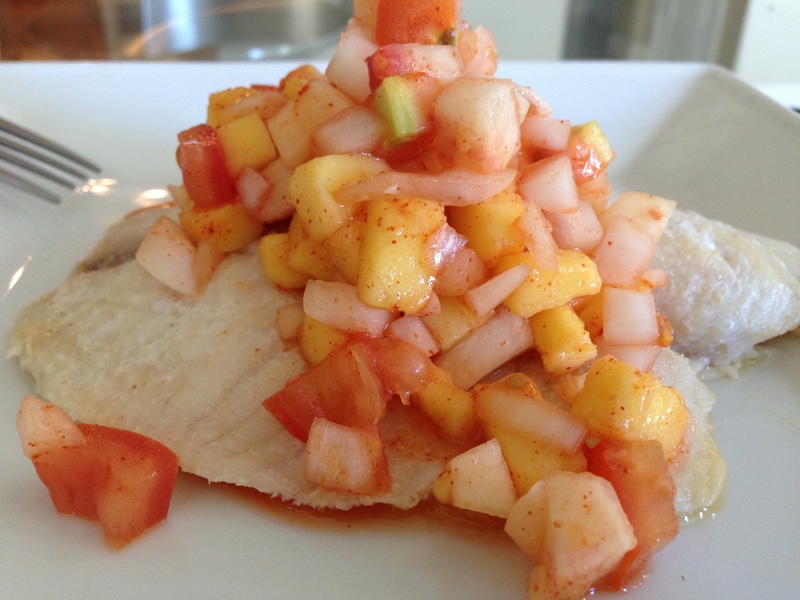 While the fish is baking, prepare the salsa. First, start with the mango, If you’re like me, you’ve been cutting mango wrong for years. Which is why it always turns into a slippery mess of unrecognizable strips . But have no fear! Google is an amazing tool. Check out this handy dandy tutorial on the proper (and easy) way to get mango off the fruit and into your mouth bowl. Once you have the mango separated from the flesh, be sure to dice into smaller pieces. 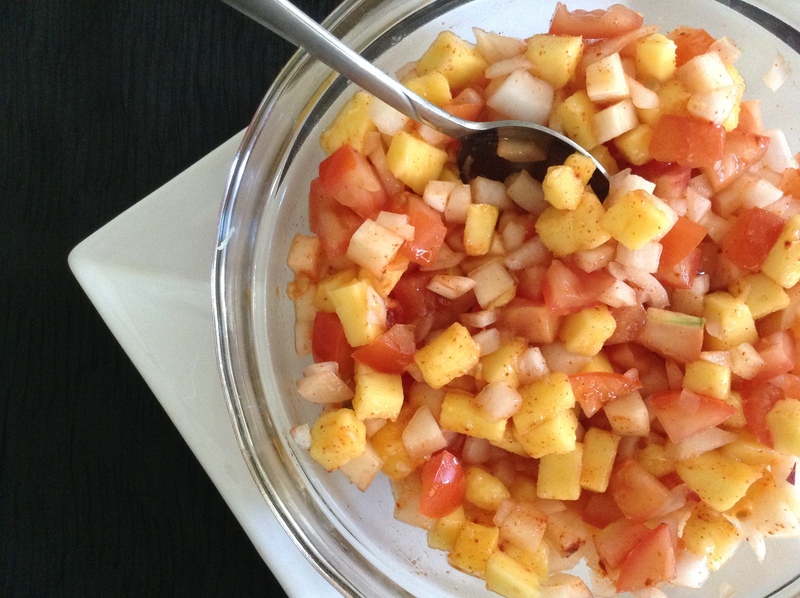 Dice the peach, onion, and tomatoes and mix in a bowl with the mango. Add the seasonings and juice from one lime. Toss gently and let refrigerate until the fish is done baking. When the 20 minutes is up, check on the fish. As usual, oven temperatures vary from oven to oven, so always check your dish for doneness. The tilapia should be flaky but not dry. When the fish is ready, remove from the oven and let cool for a few minutes. 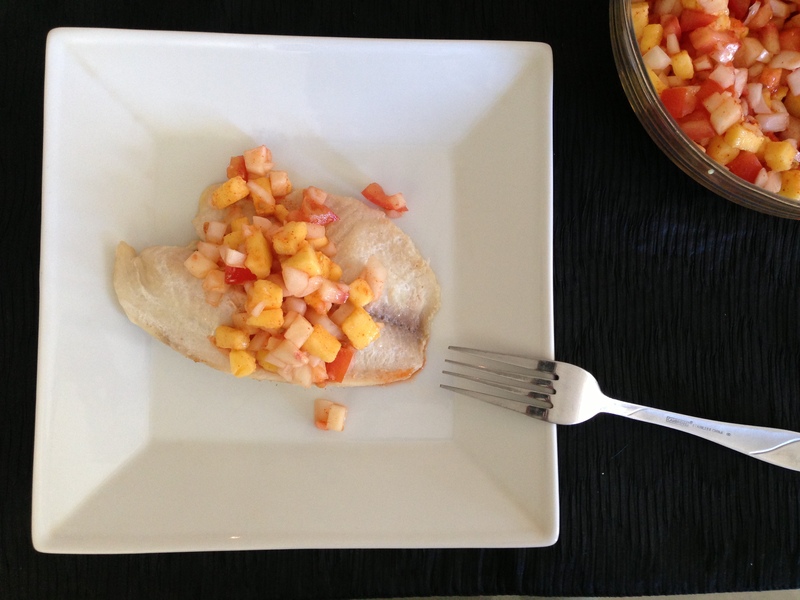 Serve warm with mango-chili salsa on top. This recipe makes two servings. If you are following a meal plan, please adjust your servings to fit your meal plan as needed.